Last minute road trips, family vi sits, and the beach are all part of summer with the kids. There’s no school, a sense of freedom, and warm weather, something always appreciated in Massachusetts. If you’ve just gone through a divorce, or are in the midst of a separation, the idea of taking a vacation is more than exciting, it can be therapeutic too. But, there are rules when it comes to taking your children on a trip, vacation or otherwise, if you are leaving the state. In Massachusetts, neither parent may remove the children from the Commonwealth without express permission from the other parent. This includes taking your children on a vacation. Before packing everyone’s bag and your cooler of snacks, review the parenting plan in your separation agreement. 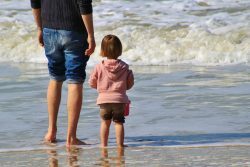 Your separation agreement is the instruction manual for your divorce and should include instructions for summer and school vacations including the procedure for out- of- state destinations. What do you do If your agreement does not have an expressly written procedure for out- of- state vacations? You must get permission from your ex-spouse to take your children out of the Commonwealth. Failure to get this permission, could result in your ex-spouse filing a contempt of court or worse, kidnapping charges. assign which parent is responsible for the children during each school vacation and the summer. One common plan has each parent alternating yearly the school vacations. If one parent wants to take the vacation out of state, write down explicit instructions as to how the other parent will be notified and any restrictions. Insert a clause that will cover any future travel plans that may not be anticipated at the time of the drafting. Many clauses will state that the parents will discuss and agree upon any future out of state travel. Try to be flexible and have a plan written if one parent needs to switch vacation plans. If your original separation agreement does not have any instructions for vacations, consider calling your lawyer to modify the plan to include vacation instructions. When in doubt whether you may or may not do something after divorce, it is always wise to consult your lawyer. It is easier to stay out of trouble then get out of trouble. Have a great trip and remember the sunscreen!